I just started using this blog planner, a free printable I found on Pinterest. The Writer's Process Blog Tour has been taking place in the pet blogosphere for a few weeks now, and I have loved reading everyone's posts about how and why they write what they do. If you are invited, you simply answer three questions related to writing and then pass the "pen" to the next blogger(s)! As a testament to my "process," I'm finally getting around to this after being invited by three of my favorite bloggers! Cathy of Groovy Goldendoodles was the first, followed by Sarah of Lola the Pitty and finally Lauren from ZoePhee. Be sure to check out all of their awesome blogs! 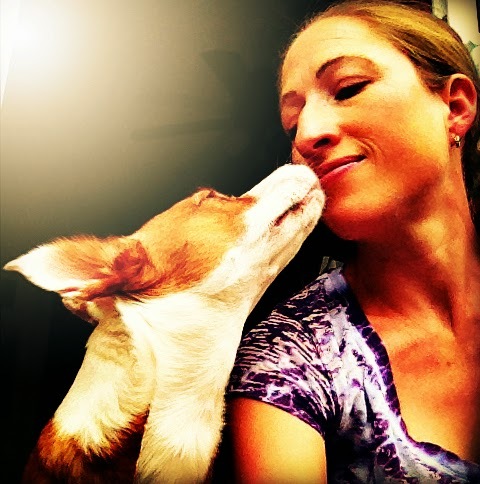 Lauren and I have a lot in common - she blogs about her adorable ginger rescue dogs and shares her experiences with force-free training. Zoe and Phoenix look so much alike that she has a special section in her FAQ about how to tell them apart! Aren't they the cutest? Right now I'm gearing up for my favorite season, and hope to have some hikes to write about as well as some fun Halloween-themed posts. Blog the Change for Animals, a quarterly blog hop focusing on animal welfare issues, is a perfect fit for me. Last time I featured the angel that rescued Ruby, and coming up in October I'll be featuring the shelter that Boca came from in The Bahamas and explaining the special plight of her fellow potcakes. I have always been a writer, am a published poet, and have been journaling online for ten years. I had been wanting to delve more into blogging but hadn't found my niche. 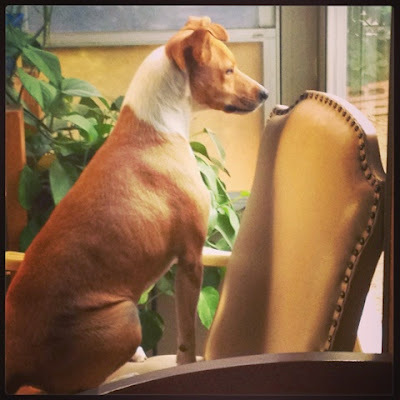 When I adopted Ruby and her reactivity surfaced, I discovered some of the wonderful blogs like My Imperfect Dog, Doggerel and Rescued Insanity that provided resources, dialog and encouragement. I decided that I wanted to share my experiences in hopes of also helping others feel not so alone with complicated behavioral issues and training challenges. As I learned more about force-free training, clicker training and trick training, as well as adopting a second dog, I honed my blog's focus. 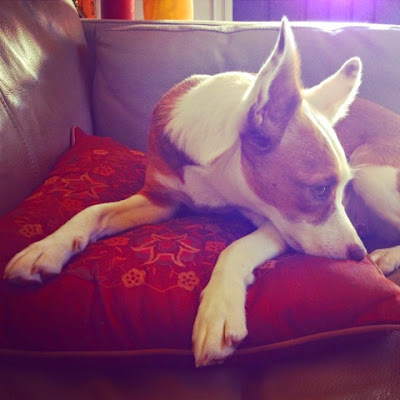 Another aspect I love about blogging is simply having an ongoing chronicle of life with two delightful dogs. I regret not having more pictures and stories about my previous dogs Freya and Lasya to look back on, and know that I will treasure this ginger sister diary. 3. How does my writing process work? 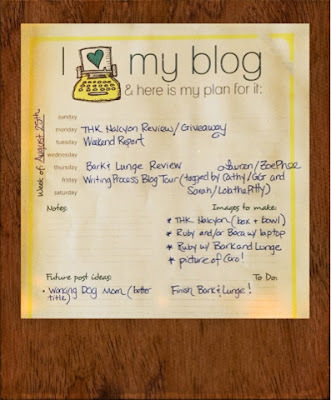 I wish I could say that I have a month or two of posts ready to go like the ambitious Kimberly of Keep the Tail Wagging, but I'm more a "fly by the seat of my pants" kind of writer. Some of my best ideas come when I'm not in a position to write, such as at work or in the car, but I try to at least scribble down some notes when things occur to me, and then sit down with my laptop in the evenings or on the weekend to flesh out the posts with links and pictures. I usually have several drafts saved and an ongoing list of topic ideas. I try to post 3-5 times a week, nearly always posting a general update on 'Ruby Tuesday,' and participating in the Blog Paws Wordless Wednesday blog hop. Now that I've shared a little about my writing process, I'm going to point you in the direction of another blogger I admire, Amanda of Dog Mom Days. 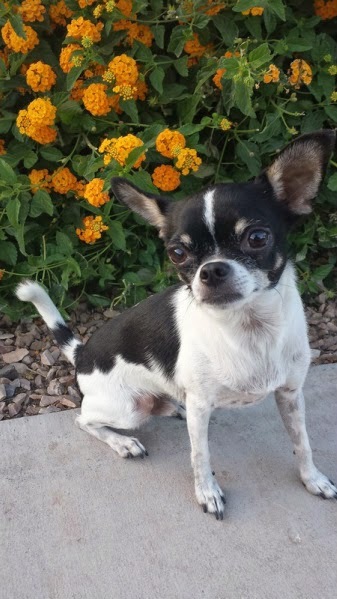 Amanda blogs about her adorable rescued Chihuahua, Wynston. She is a passionate voice against puppy mills and her life is entirely devoted to Wynston. She also shares fun ideas for pooch parties, canine crafts and dog-friendly road trips. There really is something for everyone at Amanda's darling blog, and who could get enough of this face? The Writer's Process Blog Tour has been a fun way to discover new blogs and gain insight into others' creative process. I hope you enjoyed this stop and will continue on to make some new friends. I have been following Kari Neumeyer's blog since starting my own almost a year ago, and was honored to receive a copy of her new reactive dog memoir, Bark and Lunge, for review. The memoir's subtitle is 'Saving My Dog From Training Mistakes' and chronicles Kari's experience with her dog Isis, a German shepherd from protection/security dog lines. I applaud Kari for the lengths she went to in finding a training solution for Isis that did not exacerbate her stress and anxiety, evolving from an early start with an old-school trainer who pushed prong collars, to a positive reinforcement trainer who helped to rehabilitate her. 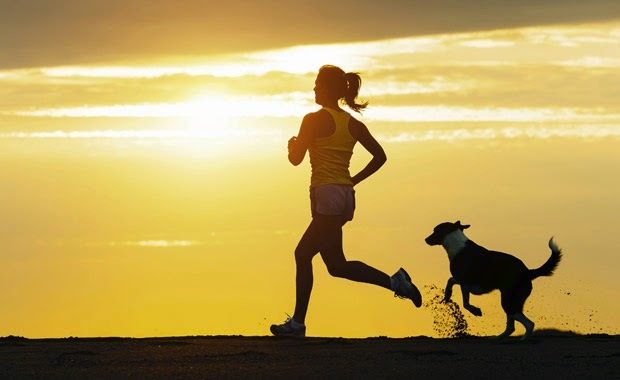 I also appreciate the variety of training methods described, the assertion that force-free trainers make mistakes too, and that not only do you need to seek out the training method that works best for your dog, but the individual trainer. There were a few parts of the book that didn't hold my interest as much, such as the lengthy description of Isis's favorite toy, but as a pet blogger who photographs and documents every move the ginger sisters make I can understand the desire to remember every last detail in tribute to a beloved dog. The introduction of her second dog, Leo, was when the story became most riveting, as Kari makes admirable and creative accommodations to maintain their multi-dog household. You did then what you knew how to do, and when you knew better, you did better. I recommend this book to anyone who has loved a difficult dog, wants to read a heartfelt dog story, or is interested in the benefits of force-free training. Enter below to win a copy of your own! 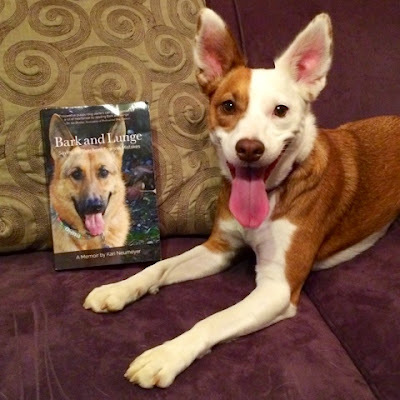 Disclaimer: I was given a copy of Bark and Lunge in exchange for my honest review. We are big fans of The Honest Kitchen at my house. I feed the Love recipe as part of the ginger sisters' rotation diet, I keep cans of Quickies stashed around the house for impromptu training moments, and they get Beams as regular treats. Not only was this review a chance to possibly add another The Honest Kitchen product into the mix, but it was also a great occasion to work with the girls on their sit-stays, down-stays, and other cues. They seemed to have a lot of fun, Ruby hamming it up as usual and Boca surprising me with her improvisation. I feed grain-free kibble at dinnertime, so I don't mind the girls having some "cereal" for breakfast in the form of the oats and buckwheat. I am also happy to see coconut in the ingredients as it has some wonderful health properties. The ginger sisters are accustomed to our morning routine of re-hydrating their food with warm water and setting the timer for five minutes while I make my coffee. They know that when the timer chimes, breakfast is served! 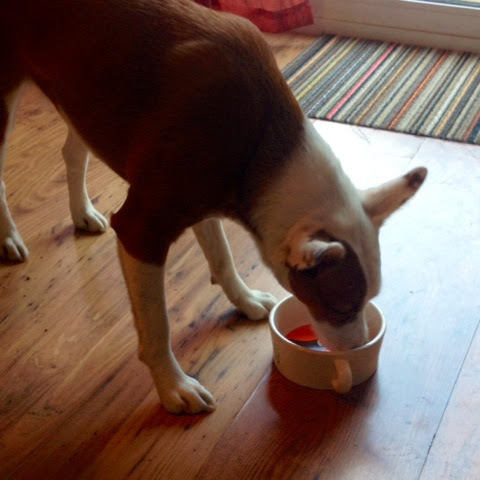 Boca is easy to please and gobbles up anything that is in her bowl (the gratitude of a street dog! ), but Ruby tends to be my picky eater. She unfortunately turns her nose up at some of The Honest Kitchen varieties, so I was delighted that she danced around excitedly while I prepared the Halcyon and licked her bowl clean. Another winner from The Honest Kitchen and a variety we can add to our rotation! The Honest Kitchen has generously provided a 4lb box of Halcyon for one of my readers to win. U.S. residents may enter the Rafflecopter giveaway below. The winner will have 72 hours to respond to notification by email. 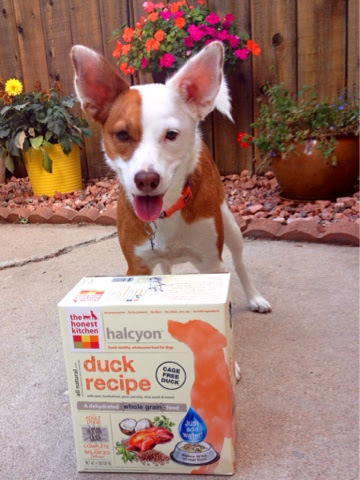 Disclaimer: I was provided a sample of The Honest Kitchen Halcyon Duck Recipe in exchange for my honest review. Based on the ginger sisters' clean bowls I purchased a 4lb box on my own, just like the one you can win! 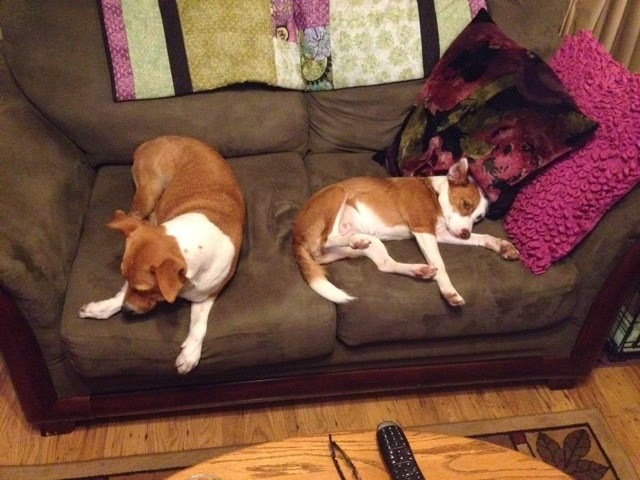 During the work-week, the routine is largely the same for Ruby and Boca. It's the weekends that we all look forward to, when longer walks, car trips and play-dates take place. This past weekend was no exception, and although it was a busy one, I made sure that the girls got to take advantage of some fun in the sun. I am so lucky that the place my horse Coro is boarded currently, Infinity Farm, is also home to our corgi friends and my dogs are welcome there - a rarity at many equine establishments. The dogs and I both enjoyed our first long trip in my new car, and they seemed to be comfortable on the new seat cover. Ruby even laid down on the edge of the seat so that she was utilizing the "hammock" feature. 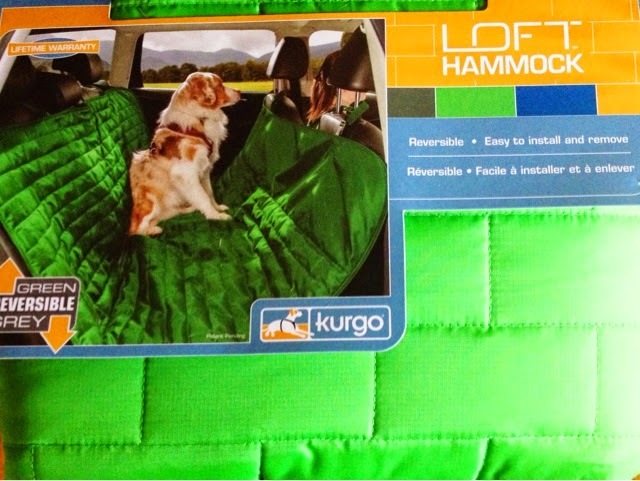 The fabric is a little slippery, but I think this encourages the dogs to settle down for the trip, something that aids in keeping Ruby's reactive outbursts towards passing motorcycles on the freeway to a minimum. Ruby made several laps of the yard before I could even get her harness off, and they all had a great time digging, barking at goats and llamas and playing "catch me if you can" while I rode Coro for the first time in far too long. I have had Coro for over twenty years, and even if so much time goes by between rides, we soon pick up right where we left off. I loved being able to amble around on his back while watching a lesson going on, and afterward all of us horse crazy ladies picnicked in the shade of a tree. It was a perfect afternoon for all. Even Ruby slept all the way home - which is something that seldom happens - and both dogs crashed for the rest of the day. They were almost too tired to eat dinner (but only almost). The next day the dogs had to stay home while I looked at barns - as much as I love where Coro is living it is a long haul and I'd like to find something closer so that I can ride more often. One place had a yak, turkeys and an ancient Australian shepherd. I think it is so fun to see all the different animals people keep on farms. Although I have lived in Denver for fourteen years now, I will always be a country girl at heart. Last night, the ginger sisters decided that they wanted to participate in Monday Mischief: Boca stole a sandwich and Ruby made a plaything out of an unfortunate moth. My dad and I were eating grilled cheese sandwiches and watching Parts Unknown and he left his plate on the coffee table for a moment to get a glass of water. Boca sniffed her way over to the plate, and despite my scolding "Boca...no no...leave that," I could not stand up fast enough to stop her and watched as she snatched the toasted cheese morsel. She did drop it halfway across the floor, and I had to laugh at her bold street dog thievery. I let the girls out on the patio one last time before bed, and Ruby took the opportunity to grab a medium-sized moth that was hovering near the ground and ran gleefully back inside with it. She is the consummate keep-away artist, so I knew there was no chance of getting it away from her, and instead watched in a combination of intrigue and pity as she toyed with the insect. She must have caught and released it about twenty times, holding it gently enough in her mouth before letting it flap away so she could bat it with her paws and snap it up again. 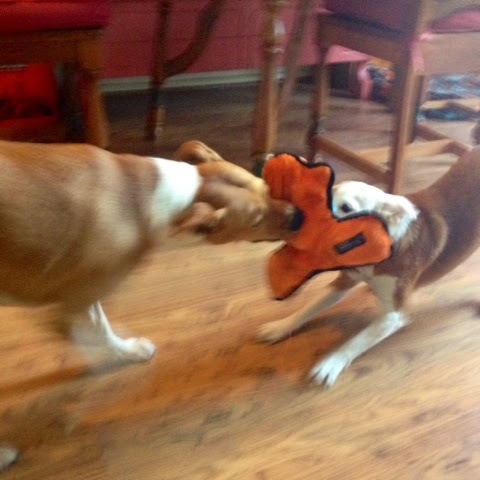 She was delighted with her game and was wagging her tail happily the entire time as well as trying to share her fluttering toy with Boca. She lost interest once the poor moth succumbed, and I was glad at least that she didn't eat it. Do your dogs chase or play with bugs? My Norwegian elkhound Freya was afraid of flies, bless her heart. Last fall's trip to the Mountain Goat Lodge is something I've wanted to post about, happening as it did in my pre-blog days, and today seemed the perfect time since it coincides with Throwback Thursday. I planned this trip just a few weeks after adopting Ruby, before her reactivity really became apparent. It was an extension of a work trip, a dinner meeting in a small Colorado town, and I thought it would be the perfect opportunity to bond and spend some uninterrupted time with my new rescue dog. By the time the trip rolled around, we'd decided to discontinue doggie daycare, been politely asked to withdraw from our group obedience class, and I was in full-on panic mode about what I'd gotten myself into with this challenging, high-energy dog. I was nervous about the trip and considered canceling, but thought a change of scenery might do us both some good. I packed her crate, dishes, all sorts of treats, food for several days, toys, antler chews, and the dog training book I was reading at the time, Control Unleashed. I didn't know what to expect, but I knew our destination was a family-run, dog-friendly bed and breakfast, and was determined to pull off this mini-vacation. 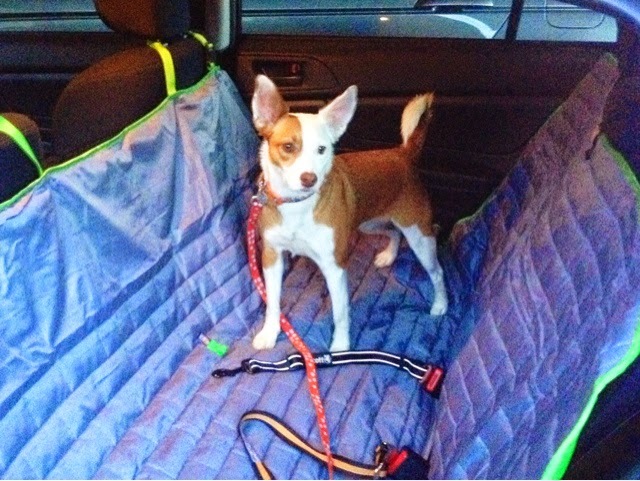 It was about a 3 1/2 hour drive and Ruby did some barking out the window at cyclists and motorcyclists. We arrived with just enough time to get settled before I had to go into town for my dinner meeting. Our room was homey and comfortable with a view of the Sawatch mountain range. The proprietors also had a goat farm, and we could hear them bleating from their pasture below. 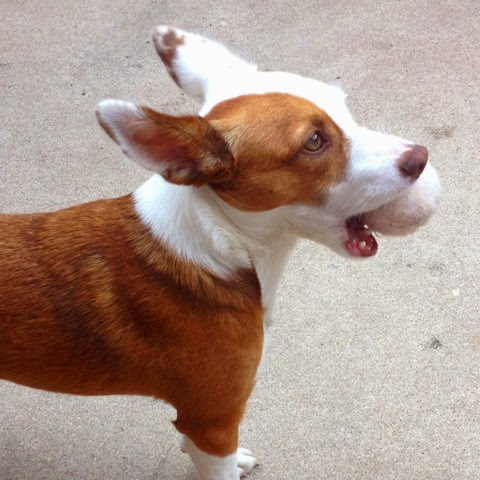 Ruby immediately buddied up to the owner's miniature Australian shepherd, Sookie. 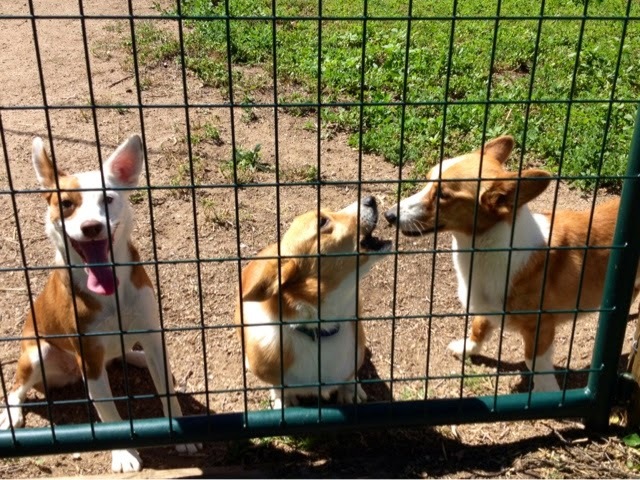 They had so much fun chasing each other around the fenced dog run and Sookie would come scratch on our door when she wanted to play. They were the same size and perfectly matched. I left Ruby in her crate while I was at the meeting, and I could hear her barking and whining as I went downstairs. I was gone for several hours and worried that she would not settle down. I didn't get any complaints when I returned, but as a dog-friendly establishment I think they had a high tolerance for that sort of thing. Some other guests had arrived, including a couple with a German Shepherd in the neighboring room. The dogs could see each other from our balconies and tended to set each other off. Ruby had trouble settling down that night, and I considered cutting our trip short, but the next morning was so beautiful that I decided to stay on. All things considered, Ruby was doing quite well and seemed to be having some fun. I got some breakfast downstairs and visited with some of the other guests, then spent the day reading, taking Ruby for walks on the property and letting her play with Sookie and meeting the resident goats. Ruby was afraid of the goats, which is probably why I didn't get any pictures of them. We made a quick trip into town for some fast food that evening and took a stunning sunset walk. A man with three terriers arrived after dark and Ruby was very upset by them. I remember being discouraged during parts of the trip, thinking how such activities would be limited for us, but in hindsight knowing just how reactive she is, I think she did remarkably well. After another delicious home-cooked breakfast of goat-cheese omelet and fried potatoes, we left the next morning and Ruby said goodbye to her blue-eyed friend Sookie. As I packed up our things, one family was downstairs visiting about Game of Thrones while their teenage son played the piano. Another couple had arrived with a Great Dane and the atmosphere was one of camaraderie and leisure. I was reluctant to leave and wished we could stay a whole week, knowing that Ruby and I were both just starting to relax. While traveling with a reactive dog is probably not something I will choose to do very often, with careful management and realistic expectations as well as dog-friendly businesses, I am happy to know that it can be done. 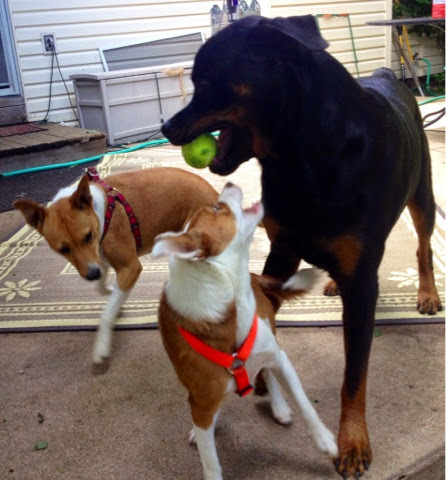 Last Friday, the ginger sisters were invited for a playdate at my friend's beautiful patio oasis with her Rottweiler, Tugg. Ruby and Boca had a wonderful time racing around the multi-level deck, sniffing the pond and fountain, and bossing the gentle giant around. Tugg was such a sweetheart and allowed the girls to steal his toys and bones. Boca seems to enjoy policing Ruby's interactions with other dogs like the big sister that she is, and I think Tugg was intimidated by their raucous vocalizations. Ruby was her usual relentlessly exuberant self, hardly noticing that Tugg outweighs her by about one hundred pounds! My friend and I were able to catch up while the dogs romped, reminiscing about dogs past and sharing stories about our newest additions. She told me about the rally obedience classes she takes with her boy, and the format sounded brilliant! 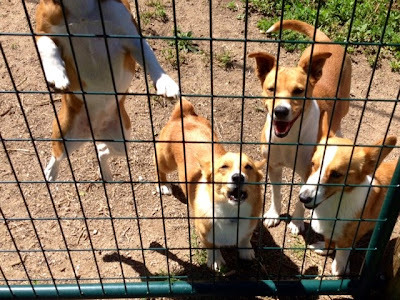 The dogs are allowed to play and burn off energy in a supervised dog-park-like setting while the handlers have a more focused discussion in a classroom, and then humans and dogs reunite for practice. A scenario like this might actually work for Ruby since she is unable to focus around new dogs. Once she has met them off-leash she can normally do what is asked of her. 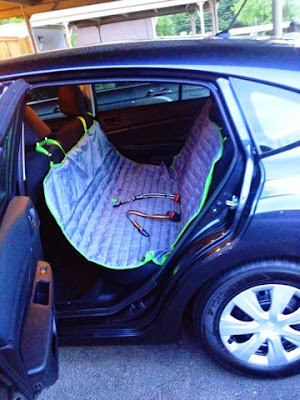 I thought this was such a great idea, and something I may look into. 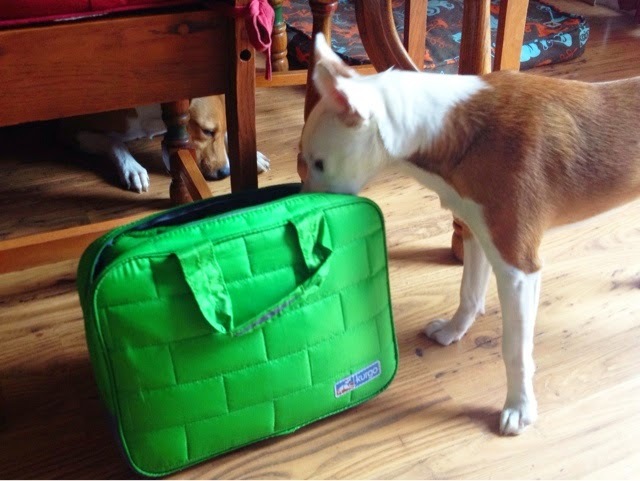 On our way home we stopped at the Kyjen office to pick up the generously contributed Slo Bowl for Ruby's Gotcha Day Giveaway - congratulations to winners Sarah of Lola the Pitty, Carrie of Tales and Tails and Chrissie of Pupcycled! 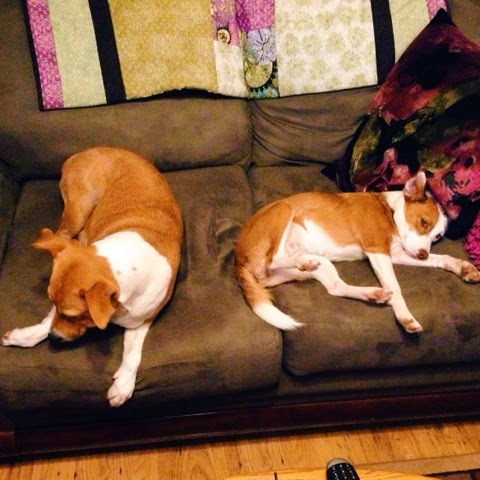 The ginger sisters hardly moved for the rest of the day, and by the evening they looked downright miserably tired. They weren't even interested in their evening walk. In the above picture they look like they are nursing the canine version of a hangover! I love that Ruby and Boca have so many opportunities to play until they drop with their pup pals and that their people are just as nuts about dogs as I am. 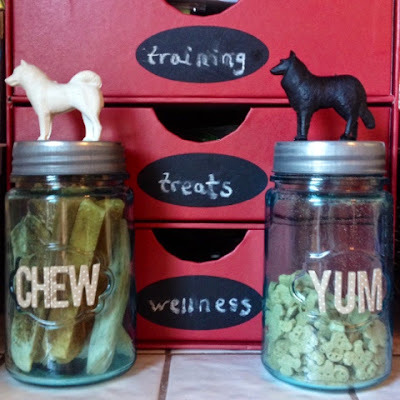 I also wanted a nicer way to keep the clickers, extra treats, nail clippers, medications and all the rest of the doggie items I reach for frequently that were cluttering my countertop. I found this three drawer organizer at Michael's, but I won't recommend it because it fell apart immediately and my dad had to reinforce it for me. I have seen sturdier ones at The Container Store. I purchased the chalkboard labels and like that I can change them if I ever rearrange the contents. 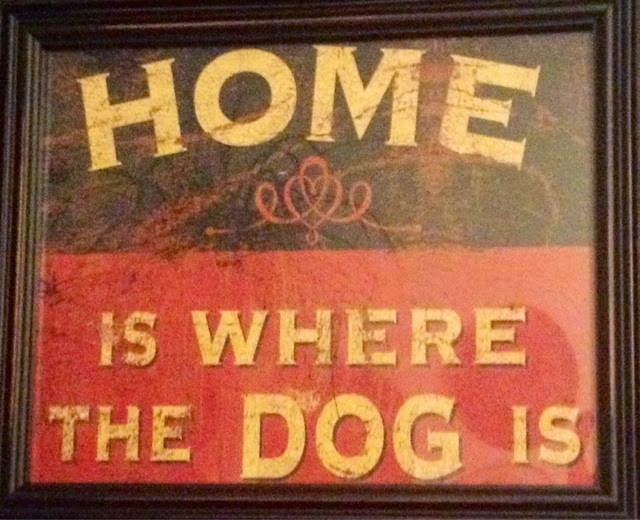 I completed my spruced-up doggie station with this framed print, also from Michael's. I was so excited to find it because I've been wanting something similar. I love the vintage look and the colors are perfect for my kitchen/dining area. There are so many fun ways to organize canine accoutrements and turn your home into a pup's paradise - I've even started a Pinterest board for my dog-friendly dream home. These little projects just make me want to do more! I wanted to be sure that Ruby had a special day for her very first Gotcha anniversary on Sunday. 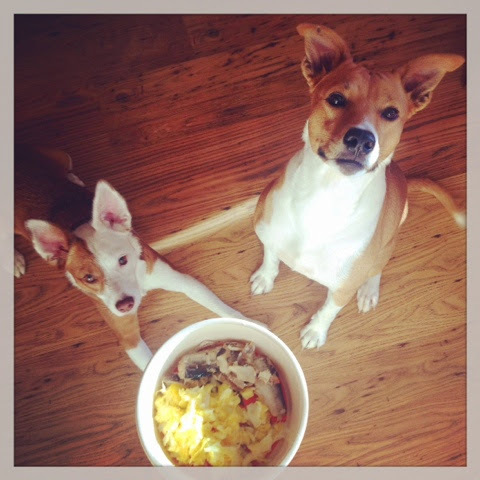 The ginger sisters started the morning with eggs scrambled in coconut oil alongside sardines. It was funny to watch their different approaches: Ruby ate her eggs first and was a little uncertain about the fishy side dish, while Boca finished the sardines before the eggs. We had two nice walks, the first through a swampy area by the light rail station and back over Ruby's "digging hill." I think she smells the little voles or mice that live in the field and her terrier side takes over! I ran with the dogs across the empty parking lot. Boca jumped in the air for joy and reminded me of a bucking pony and Ruby raced ahead. Throughout the day we played a lot of fetch, and Ruby and Boca had a wild game of tug with their Kyjen Invincibles toy (which is mainly invincible because I only let them play with it for short, supervised sessions). It makes a funny honking sound that Ruby seems to particularly enjoy, because even after Boca stops playing, Ruby will continue to make it squawk for as long as possible. My dad and I went to an early movie, giving the girls time for their afternoon naps, and returned with more delicious treats: The Bear & The Rat Bacon Peanut Butter Barker doggie ice cream, made right here in Colorado! After another walk and dinner of kibble and chicken breast, Ruby and Boca enjoyed their frozen dessert. As you can see, Ruby licked her bowl clean, and I think she thoroughly enjoyed her day. 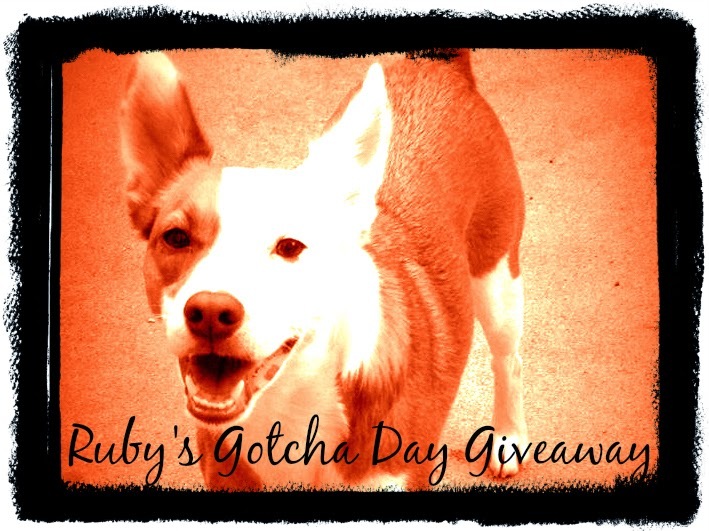 Don't forget to enter Ruby's Gotcha Day Giveaway running through Friday! 1. Ruby's Gotcha Day Grand Prize: A Spindrift Max Walker Leash, a Kyjen Slo Bowl , Sweet Pea Kitchens treats, Sojos treats, an Acadia Antlers moose taster antler chew and a box of The Honest Kitchen Pro Bloom. It's hard to believe it's already been a year since I drove home in a torrential downpour and resounding thunder with a little red pup in the back of my car. Ruby is a high-energy, high-drive, super-intelligent dog and challenging in so many ways, but I adore every last ginger and white hair on her body. She has required me to be a much more educated, engaged dog owner than I ever was before, and opened my eyes to new training methods, new hobbies and new friends. I am a very skilled Defensive Dog Walker. I know a great deal about reactive dogs. I now know that Freya was an easy one! I go for two to three walks a day - no exceptions! I have gone off the beaten path to find peaceful places to hike. There are more dog toys, treats, collars, harnesses and leashes in my house than I ever thought possible. I share my bed with dogs, and they are superb snugglers! I do my best to shop force-free. I started this blog - which in itself is huge because I had been interested in blogging for quite some time but couldn't decide on a niche. Ruby makes sure I always have something to write about. I take pictures constantly, because how can I not? I have met so many wonderful rescue folks, trainers, dog moms and pet bloggers - too many to list here, but special mention to Colorado Animal Welfare League, Delightful Doggies, Jessica of My Imperfect Dog and Kimberly of Keep the Tail Wagging for all of their support! See my reading roll on the sidebar for a sampling of the other amazing blogs I follow. After five years of living in my townhome, I finally turned my patio into an enjoyable space for humans and dogs alike. Summer evenings have improved immeasurably. 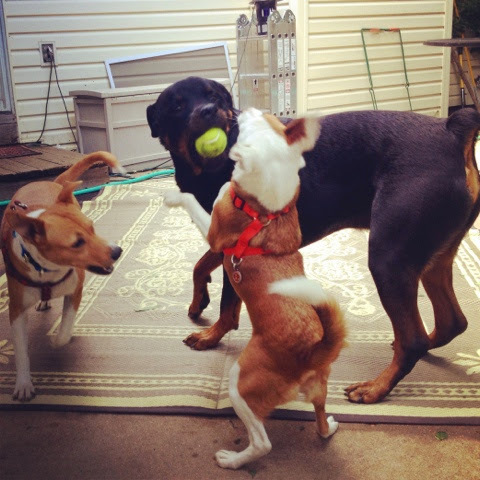 We have so many great doggie playdates with the corgis and the labradoodles! I'm suddenly a morning person. Ruby is the most reliable alarm clock I've ever had, she does not have a snooze button, and I've come to love our sunrise walks and my productive weekends. I adopted Boca, who could not be a more perfect addition to this little family. I am always researching better food, safer equipment, and current wellness information. I cook for my dogs. I used to shy away from dog kisses. Ruby gives the best ones, and she is so enthusiastic that it is futile to resist. There are so many more, but what I most want to say in honor of this one wild year, is that Ruby has taught me how to love more. I have loved all of my animals, and it's no secret that she has not been an easy dog, but it is exactly in those ways that I've been pushed to be more patient, more compassionate, more aware, more sensitive. Sometimes I look at her when she's curled up next to me with her little pink lower lip sticking out and her nose twitching in a dream and feel that my heart might burst. She has taught me how to love every dog, most especially the one you have. Happy Gotcha Day, Little Sister.